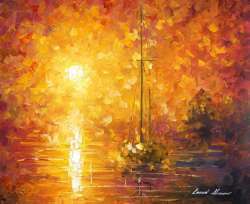 I randomly found Mr. Afremov's art while searching around Deviantart. Ever since I first laid eyes upon the bright colors and breathtaking paintings I have found myself obsessed. My searching led me to his personal website. I followed him on facebook for some time too before making a purchase. It all seemed too good to believe. I placed my order, purchasing "Night of Expectations" and "On the Way to Morning". I was overcome with such excitement and eagerly waited until I got the email confirming that they had been shipped. When they finally reached my home I eagerly opened the package and literally sat in front of my treasured paintings and just took in every detail for probably 20 minutes. I was so eager to get them hanging on my wall. They look fabulous! I keep eyeing the site and checking out the deals. I am positive that this will not be my last purchase! Thank you for providing the world with such wonderful and inspirational art! Thank you for making it very affordable as well!